Check out all the awesome stuff we get up to in Room 7, at Pt England School. Check out video about our Whakapapa boards we made with Miss Tito, as seen on PENN. Class 6 tells the story of the Titanic for PENN. 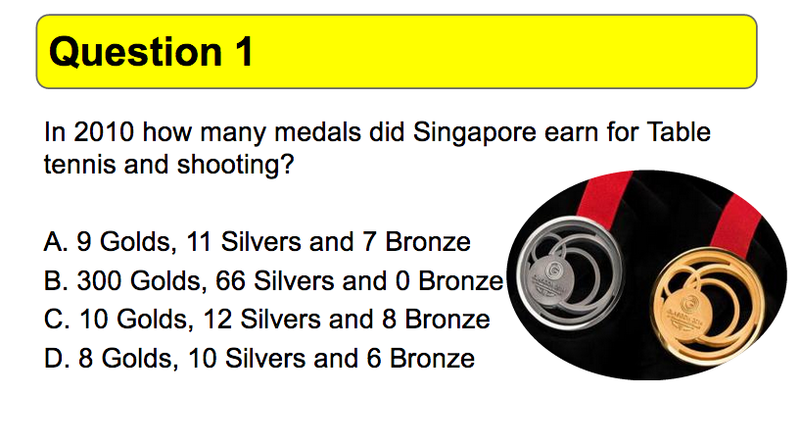 See if you can take our Commonwealth Games Quiz. Class 6 worked very hard on their entry into the Manaiakalani Film festival for 2014. Their movie tells the story of the random and crazy thoughts that one student had while daydreaming in class. Watch how he is able to use his daydreams to turn them into a great piece of work for school. Please watch, and be sure to leave a comment. 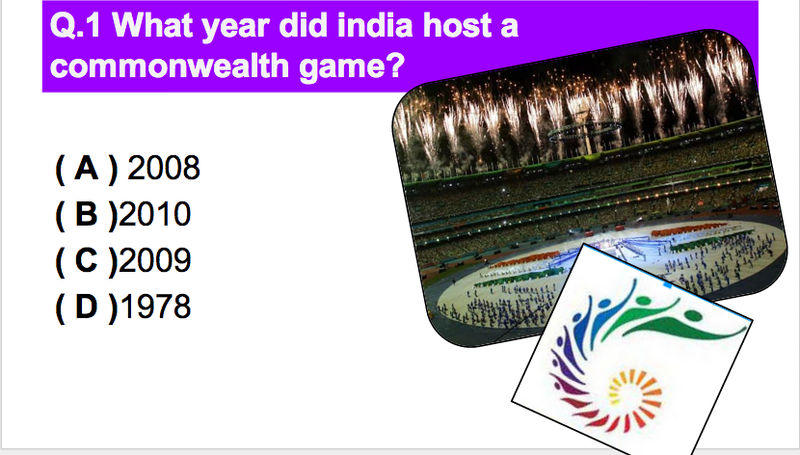 In Class 6 we have been working really hard this term so far to create a Website around the 2014 Commonwealth games! Click here to go to our website. 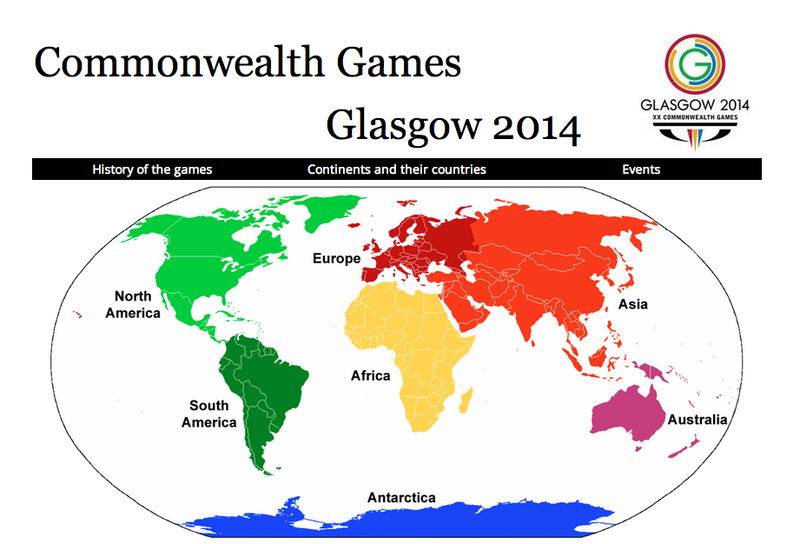 Our website has information around some of the countries in the commonwealth games. We made quizzes using the information to test our readers. Please go to our website and check them out! This is my cabin on the titanic. Have you ever been on a titanic. I have my own little private room and dinning room. My cabin is a first class and this is so expensive. As for my room it has details on my wall and my blanket. I have two little candle sticks above my bed to keep me warm and for me to see when it is dark. I have got my own table for me to eat alone and have some peace and quite. This is my F.B.A.C stands for Flying boat advice column and it is a problem David Franklin needs help because he is new to the field of coral-reef research. Today in our MDTA PLG we were learning to record screencasts, so this was my first attempt at one. This is a quick look at a typical weeks worth of group work in my reading programme. It should be noted that these tasks are not given to the students without specific teaching and scaffolding involved, in no way are these tasks just given to the students without any guidance. In the first activity involving the list of questions, I mentioned that I was trailing something new and that there were more instructions than usual. These instructions were first explicitly given to the students by me, and I had scaffolded the students into how these questions were to be answered in a guided session. 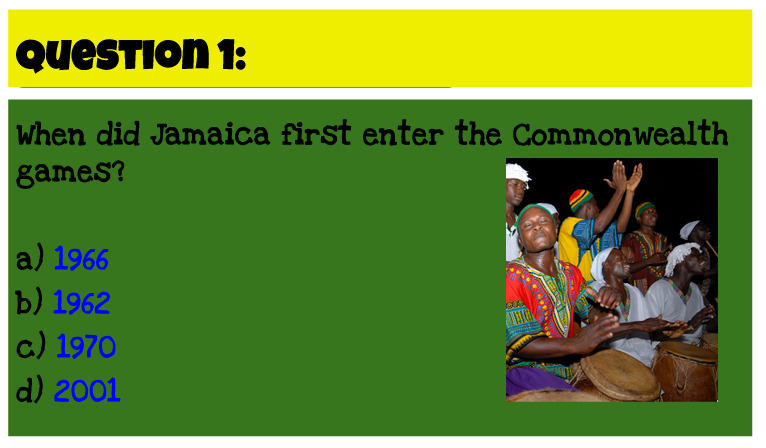 The instructions on the activity were more a reminder to the students. 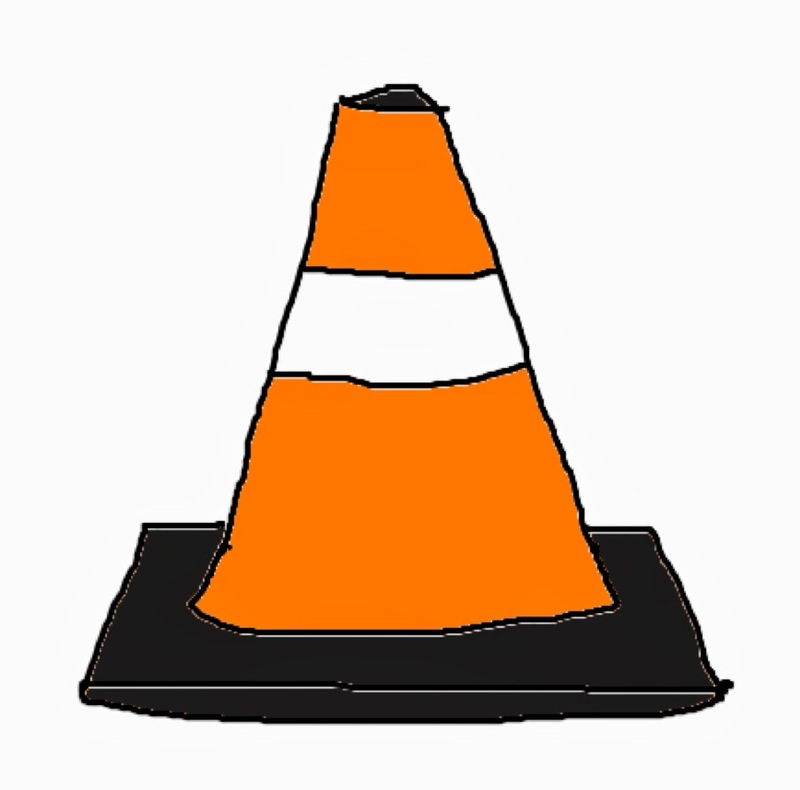 NOTE: This is for version 9 (the Yellow one). Recently we were playing with some stop start animations. When uploading our photos into iMovie we were being driven crazy by the Ken Burns effect as it was set on automatically. I thought others might also be having this problem, so heres the trick! You need to change your "Project Properties". Right click your project, and click Project Properties. 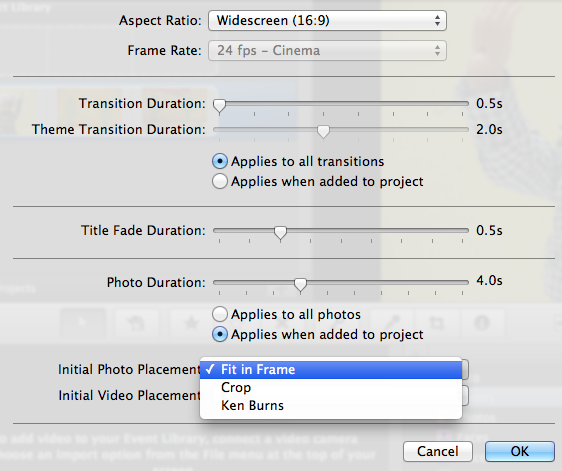 Then change your "Initial Photo Placement" from Ken Burns to "Keep in Frame". 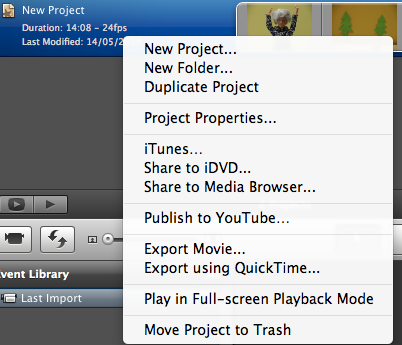 Now you can import your photos into iMovie without the Ken Burns effect! You can also change the length of your photo duration for all photos here as well (great for animation) for help with this in version 10 (purple one) see here. As part of our MDTA digital PLG work, we were set the task of building a google site that could be used to assist our teaching of the term 2 inquiry unit. 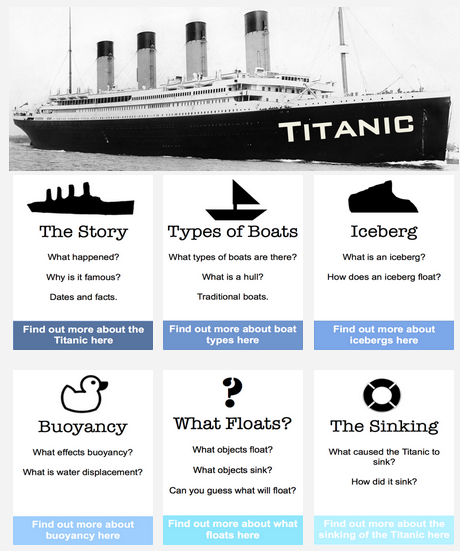 As part of my teams "buoyancy" unit, I decided to create a site around the theme of the Titanic. So far our students are enjoying being able to go onto the site and explore (particularly getting to watch the sinking animations). One student admitted to Mrs Burt that they had thought the site was a "proper website". We have been looking at how and why the Titanic sank, and will be using the Titanic to help us explore some tricky scientific ideas. This blog posted is all about a man that named Rata he wanted a big tree and he cut it down and when he cut it down something magical happen and it has something to do with a song and I'm not going to sing it to you. My reading group and I red a book about a Kokutu and so we had to do an activity about the kokutu. an it is a generous and smart bird it so interesting to look at. In reading we have been lerning about takapu. We have been doing silent reading in class every morning (teachers too!). Its a great way to start the day. We have been creating our own writing rubrics to follow when we write. In my group I have been thinking about what I need to do to write an effective paragraph. Here is a rubric i'm going to use to reflect on my writing. Here is a sample of some of the work the Wekas group are getting up to in reading. We have been learning about maps and coordinates in maths this week. Here is a map made by Rowana in class 7. 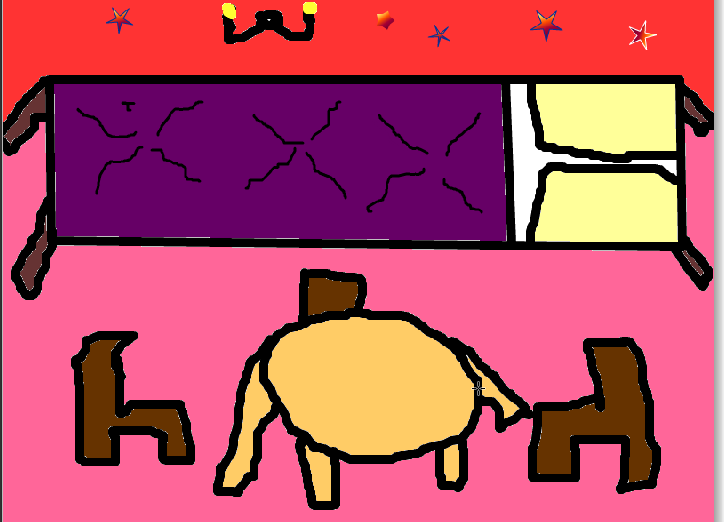 Hi Here is a Map game Iv done in class figure out witch Shape you land on.Please leave me a comment.Enjoy. Looking for good yucky bugs! Yesterday we went looking for "good yucky bugs" as part of our Statistical investigation. We found lots of different bugs including Ants, Slaters, and Worms. Exciting stuff happening to one of our class caterpillars today after the weekend. It has started its metamorphosis into a butterfly, it will be a chrysalis soon. Keep an eye on this guy! In class this week we have been doing Statistical investigations, and learning to create Charts in Google Spreadsheets. Here is a blog post by James. More boys walk to school then girls. More girls go on the car then the boys. 4 girls go on the bus and no boys do. 3 boys go ride on the bike and girls don't. 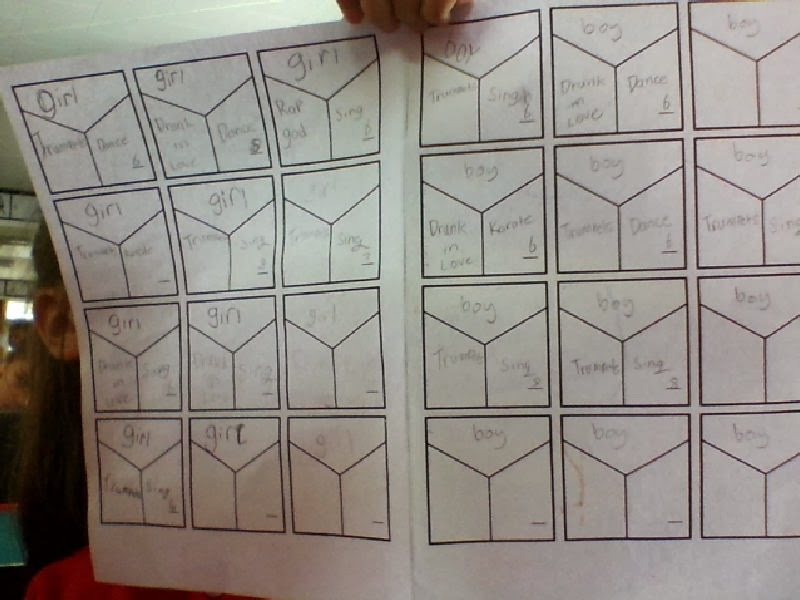 For maths this week we have been using data squares to learn about our class. Here is a post by Brooklyn in Class 6. I predict that the girls would mostly like Drunk in love than Trumpets. I predict that the boys would mostly like Trumpets than Rap god. 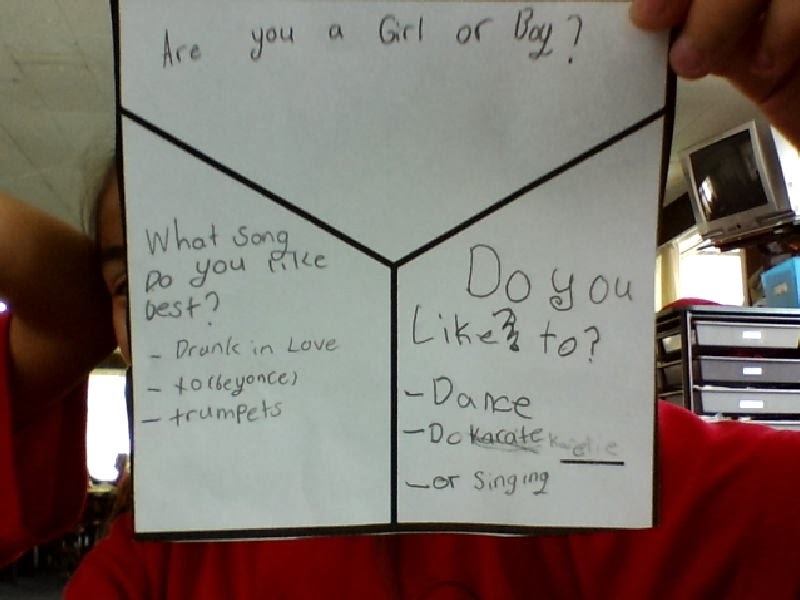 I predict that the girls would mostly like to sing than dance. I predict that the boys would mostly like to sing than karate. I found out that more people in the classroom like the song trumpets than drunk in love. I found out that only one person in the classroom liked Rap god. I found out that more people in the classroom like to sing. I found out that only two people in the classroom like to do karate. In class this week we have been blogging about some of the highlights from our holidays. Here is a post by Stevenson in class 6. Waiting for my friends, Collin and Tai, I listened to music. It took a long time to pick me up but they eventually did. I was exhausted with the long drive that I nearly fell asleep. Finally we had arrived at the beautiful Parakai Springs at a time of 12:00! Entering the pools my friends and I waited in the que to pay for our entry fee. After paying Collin, Tai and I sprinted off to the hydroslide. “WOOHOO!” We screamed while we slid down the twisty and tourney slide. Running back with my friends we slid down again, continuously. It was fantastic! It was a rough time of 4:00 so my friend, Tai’s, mum decided to leave Parakai. Tai and Collin sang the songs that were playing in the car while I fell asleep. We drove safely back home. Experiencing Parakai Springs was awesome. I loved the slide the most as it had twist and turns. First post on this new blog, watch this space! Check out some of the cool stuff we have been learning about in Room 7 at Pt England School. Cooking Sweet & Sour Pork! !